The Tacoma Fire Department Fire Extinguisher Self-Inspection Program is one of two acceptable options for meeting the annual extinguisher inspection requirement of the adopted Fire Code and NFPA 10. This program applies to dry chemical extinguishers only. You can follow the procedures listed on this site or hire a certified extinguisher company to perform the annual inspection. 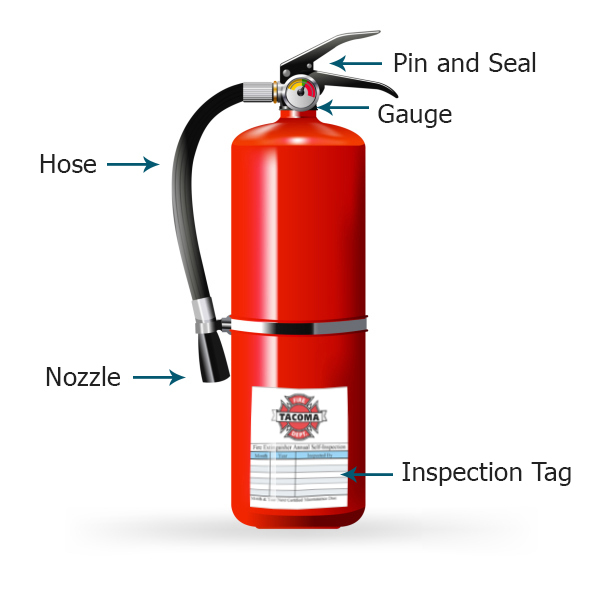 To participate in the program you will need to affix self-inspection tags to all of your dry chemical extinguishers. You may obtain them from fire department personnel during your next annual building inspection or print them from this site and affix them. We encourage you to check with your insurer or any licensing agencies to verify they accept self-inspections. Verify that the extinguisher is in the proper location with no obstructions to access or visibility. Ensure the gauge shows the extinguisher is fully charged as indicated by the needle pointing to the green area. Check that the pin is present and that the retaining seal is intact. Inspect the nozzle and hose by checking for blockage or signs of damage. Invert the extinguisher and shake it to keep the extinguishing agent from compacting. Heft or weigh the extinguisher to verify that it is full. The correct weight is listed on the side of the extinguisher. Inspect the main body of the extinguisher for any visible damage such as rust or dents. Sign your name, and add the month/year that you completed your inspection on the self-inspection tag. Make sure to place the extinguisher back into its bracket with the label facing forward. This program does not include the following required maintenance that shall only be performed by a certified extinguisher company. What happens if I forget to do my annual inspection or if I don’t record it? If you fail to complete or record your annual self-inspection you will be required to have the extinguisher(s) serviced by a certified fire extinguisher company before continuing in the self-inspection program. How do I know when my six-year recharge or 12-year hydrostatic test is due? You can find the manufacture date on the body of the extinguisher which is typically on the label or stamped on the neck or the base. The first recharge shall occur six-years after the date of manufacture and the first hydrostatic test shall be done 12-years from the date of manufacture. Use the service tag affixed at the completion of the service/test to calculate the next required maintenance date. Can I just buy new extinguishers? Yes, you may purchase new extinguishers to replace ones scheduled for recharging, hydrostatic testing or that are damaged. What if my extinguishers are not dry-chemical? Hire a certified extinguisher company to service all other types of extinguishers.